Inflammation initially is a good thing. When the body is injured or invaded by pathogens it creates inflammation, it is it’s first line of defence. The pain, swelling and redness are the start of the healing process, and are the signs of the repair mechanism being activated. So, acute inflammation results from a specific injury and subsides as the injury heals. It is when a normal inflammatory response progresses to an ongoing inflammatory process that spreads throughout the body that it becomes a problem. This reflects an imbalance which can then lead to auto immune disease, cancer, diabetes, heart disease, premature ageing and obesity. Inflammation, therefore, in small amounts protects health, but if it continues for any length of time it can become harmful. Whether it is a bruise or bacteria, the body responds rapidly to any perceived threat. It signals for proteins such as cytokines that put the body on emergency alert and tell cell DNA to trigger specific changes including the release of more cytokines. They also promote oxidation, another useful immune mechanism but if imbalanced can wreak havoc. Overoxidation creates an excess of unstable free radicals which can damage DNA and increase inflammation. 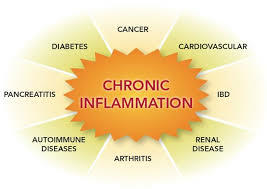 The risk factors for chronic inflammation include smoking, obesity, heavy metal exposure, long term infection, toxin exposure, inflammatory foods and allergies. These challenges put the immune system on high alert but over time it is unable to sustain it, resulting in the cumulative effect of the DNA-adjusting cytokines rapidly damaging health. Poor circulation is a secondary risk factor for chronic inflammation because it can cause the blood to become sticky. When this blood and inflammation combine they can negatively affect every system in the body compromising the immune system and leaving you vulnerable to disease. So a balance in the relationship between circulation, inflammation and immunity is critical for long-term health. A number of studies have shown that visceral fat, the weight we carry around our middle, contributes to inflammation, and vice versa. This is a significant risk factor in metabolic syndrome or prediabetes, a problem which is rapidly on the increase and related to chronic inflammation, cardiovascular disease, obesity, insulin resistance and other factors. To make matters worse, elevated levels of the stress hormone cortisol join forces with visceral fat to produce even more inflammatory cytokines. Pro-inflammatory foods are another huge factor. It is so important to stay away from processed foods, sugars and trans fats. Processed and fried foods and those that have been grilled too much are high in advanced glycation end products (AGEs), which trigger oxidation and inflammation. One study, conducted by researchers at the Mount Sinai School of Medicine, outlined how dietary changes can have a profound impact on inflammation and health. Two groups were assigned separate diets. One ate a normal Western diet, high in glycotoxins. The other was asked to poach, stew or steam their meals — cooking methods that produce fewer glycotoxins. After four months, the latter group showed dramatic reductions in inflammatory markers and had other indications of improved cardiovascular and metabolic health. Making good food choices is very important to prevent inflammation and eating a good quality protein such as cold water fish to increase the levels of Omega 3 fatty acids because they are anti-inflammatory is a good idea. Also nuts, whole grains, fruit and vegetables especially the green variety. These foods are high in antioxidants and anti-inflammatory compounds, which will help counteract the effects of glycotoxins, free radicals and inflammatory proteins. Phytonutrients from plant foods tend to be high in antioxidants, flavenoids and other powerful health-promoting compounds. Richly coloured foods like tomatoes, squash, yams, peppers, blueberries and strawberries are excellent sources. Also cruciferous vegetables, such as broccoli, kale and cauliflower as they metabolise a compound known as DIM (3,3‘-diindolylmethane), which controls inflammation, modulates eostrogen metabolism and even fights cancer. Probiotics can help to reduce chronic inflammation and maintain the balance of healthy flora in our digestive system. They can also help control weight gain, enhance our immunity and even boost our mood. To maintain our health and prevent chronic disease we must learn to quieten our busy lifestyles and not neglect the routines that help. It is important to prepare healthy meals rather than grabbing junk foods, get a good night’s sleep, exercise and have some quiet time doing nothing except taking some deep breaths. Chronic stress floods our bodies with cortisol and other stress hormones associated with the fight or flight reflex, which has a direct link to inflammation. So it is important to learn how to turn off the stress switch, or at least turn it down. Start doing things that promote a lasting sense of inner peace such as mindful meditation, breathing practices, yoga, tai chi. Take long walks, or swim because exercise is also anti inflammatory. Sleep is the body’s natural way of rejuvenation. Even if we eat well, exercise and control stress, lack of sleep can undo all of these efforts, triggering chronic inflammation and other long-term damage. In addition to cytokines, there are a number of other proteins produced by the body that can fuel inflammation. Chronic inflammation and oxidation are part of a vicious degenerative cycle, increasing free radicals, which damage DNA and damage cellular integrity. There are a number of antioxidant supplements that can help reduce oxidation and fight free radicals, providing powerful anti-inflammatory effects as well: alpha lipoic acid, glutathione, acetyl L-Carnitine, vitamin C. Botanicals like curcumin from turmeric and the bioflavonoid quercetin are all potent antioxidant and anti-inflammatory ingredients. They effectively neutralize free radicals and the damage they can cause, reduce inflammation and enhance your health and wellbeing. Serrapeptase is a proteolytic enzyme that digests inflammation, scars and non-living tissue, blood clots, cysts and arterial plaque. It is natural with no inhibitory effects on prostaglandins and has no gastrointestinal side effects like the non-steroidal anti-inflammatory drugs that are prescribed in conventional medicine. Several research papers have shown that joint administration of diet-derived antioxidants is more effective than their separate isolated introduction. Flavonoids which are synthesised exclusively in plants and are great antioxidants, can only be taken in by the body from external sources, mainly from foods, and apples, blueberries, blackcurrent, beetroot, seabuckthorn and grapes, among others, have high flavonoid content. There are approximately 5000 different flavonoid compounds which are found either in free form or in the form of glycosides in plants. New products that have recently been introduced here from Hungary are ‘Flavons’. They are concentrated flavonoids from many different organic fruits and vegetables that have been made into ‘jam’ and are taken under the tongue. 1 jar of Flavon concentrate is equivalent to 40kg of fruit and vegetables, and 2 teaspoons give you the nutrients from 1.1kg of fruit! So in conclusion – to reduce chronic inflammation requires a holistic, lifestyle approach. In return, however, the potential gains of such healthy improvements will ripple into every area of life, offering increased vitality, energy and vibrancy on physical, mental and emotional levels. Prev:Diet Drinks Are Not Good For You…..
Next:Why women need this particular mineral….